The average touring car of pre-war days had, of course, a body which it is easy enough to see now offered quite an extraordinary amount of wind-resistance, but even allowing for this fact it is nevertheless remarkable that the German Professor's experiments led to the conclusion that this one form of resistance was nearly twice as important as any other at 70 m.p.h. 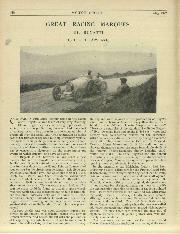 It is obvious therefore, that builders of cars of which the main object Is speed must of necessity pay consid,erable attention to reducing as far as possible the resistance they offer to progress through the air, and it is interesting to see the influence which efforts towards streamlining have had on the outward appearance of racing cars from the earliest times to the present day. Automobile" instituted the idea of holding a meeting on a deserted stretch of road at Acheres, when cars could be let out and their actual maximum speed recorded. This idea was the origin of the kilometre record which was to become so important in later days. 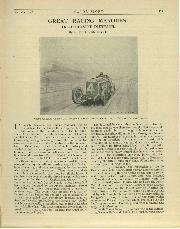 At any rate among the cars which collected at Acheres in 1898 was a Jeantaud electric car driven by the Count de Chasselonp-Laubat which covered the flying kilometre at an average speed of 39.24 m.p.h., and succeeded in. easily outpacing the petrol cars, the fastest among which were certainly two Bailees, though whether owing to their streamline form or not it would be hard to say. a sharp point in front and a fairly blunt tail. At his first attempt Jenatzy clocked 41.42 m.p.h. ; the Count answered with 43.69 m.p.h. 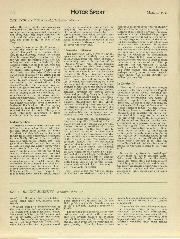 ; Jenatzy reached 49.92 m.p.h., and then the Count 58.25 m.p.h., and finally in April, 1899, Jenatzy recorded the really astounding speed of 65.79 m.p.h., at which one feels that he must have considered that it would be advantageous to provide rather more protection for the driver ! above the 1,000 kgm. limit, with the result that their tails had to be cut away and their undershields removed in an attempt to get the weight down. The condition in which they ran in the actual contest therefore, did not allow of any interesting comparisons being made with the more orthodox designs of the day. 'While energetic attempts were thus being made to save the wind resistance caused by the driver, little attempt had so far been made to facilitate the passage of the car through the air by building it lower. The credit for this development must probably go to the Wolseley Company. A car built by this firm had actually run in the Paris-Vienna race of the year before, 1902, and its designer, by using an underslung frame had succeeded in getting it so low that the top of the bonnet was not higher than the top of the front wheels. Little attempt was mad,e to streamline the car, and the driver and mechanic were almost entirely exposed, but it obviously contained the germ of the right idea. It was succeeded in 1904 by the Wolseley " Beetle," the outward appearance of which is probably familiar to all. In this case, although the und.erslung frame was dispensed with, the car was built very low, by virtue of the use of a horizontal engine, and the bonnet represented quite a good example of the " beetle-back " form of streamlining. The driver, however, sat very high up, quite unprotected, and, no attempt was made to treat the tail to conform to the bonnet. Thus streamlining was relegated temporarily to the background and little of interest happened for several years. Mention may just be made in passing of the Hotchkiss which took part in the French Eliminating Trials for the Gordon Bennet Cup Race in 1904, and which had a bonnet reminiscent of Gabriel's Mors ; and of the racing Napier of 1905, which had a bonnet of the wind-cutting type, with the radiator tubes running along its sides and brought to a vertical knifeedge in front. But neither of these designs can be considered as advanced, as those of the Paris-Madrid Mors and De Dietric.hs, and it was not until the cylinder capacity limit led designers to seek to gain speed by methods other than that of increasing the engine size that streamlining was again accorded serious study. vertical line, while a large faring in the top enclosed the spare wheel. That year also Fiat returned to racing, and the Italian racers also had full streamline tails, commencing as high as the top of the scuttle and ending in a bulbous point at the back. Thus on the eve of the War streamlining was beginning to find its way back into favour for road racing, though it was still far from universal. which they had learnt in the air during the previous four years. 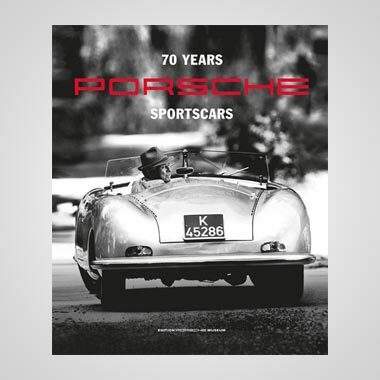 The early postWar Brooklands cars, such as the A..C., and the machines built for the international races such as the Ballot, thus tended to assume an extremely smooth exterior appearance terminated by a long blunt-pointed tail at the back. The Ballots which ran in the first post-war Grand Prix at le Mans in 1921 were excellent examples of this type of racing car, while they borrowed from the pre-war Peugeots the idea of mounting the spare wheel vertically in the tail. Wale keys As far as the Grand Prix is concerned, however, the " beetle-backs " represent the last machines of outstanding interest from the streamlining point of view, and in 1924 even the original Bugatti had come round to what may be termed the Fiat streamline form. It is true that the 1927 Talbots represented something of a combination of this now almost universal form with that of the "beetle back" exponents, possessing as they did sloping radiators and decidedly flat tops. But the Grand Prix was by then definitely on the wane, and it is not surprising that manufacturers lacked the interest to try their hands at novel streamline forms. 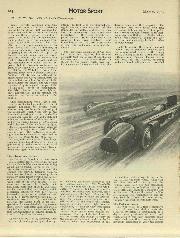 With the decline of the Grand Prix, coincided a revival of interest in world's short-distance records, and it is to this field of activity that one must now turn to trace the further development of stream lining as applied to automobiles. 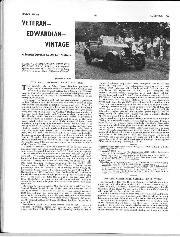 It is in fact curious how for a good many years after the War interest in the short distance records was practically non-existent, with the result that the field was for long held by such cars as the original 12-cylinder Sunbeam and Elcl,rid.ge's veteran Fiat " Mephistopholes." 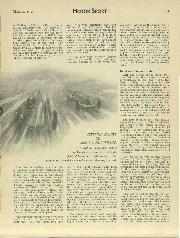 The change, however, came in 1926/7, for that winter saw the completion of three special cars all built or reconstructed specially with a view to capturing the kilometre record. The first of these cars, the NapierCampbell was very carefully streamlined, and attention was chiefly directed on keeping the car narrow. As a result the machine was not particularly low, but in order to save width a special faring was made on either side of the bonnet to accommodate the heads of the lateral blocks of the Napier "broad arrow" engine. The driver's head projected well above the top of the bonnet and had behind it a faring above the level of the narrow tail which ended in a vertical knife-edge. reduce the length of the Sunbeam which amounted to 23ft. 6ins. overall, and in consequence the top consisted of a nearly flat deck, while the angle between this deck and the sides was bevelled ',over and not acute as in the case of the Bugatti. Segrave's success on the Sunbeam in raising the record to over 200 m.p.h. spurred Campbell on to further effort, and in the following winter the Napier Campbell was entirely reconstructed. By far the most interesting feature of the redesigned car was undoubtedly the attempt which was made to deal with the rad.ator problem. The most careful streamline form, designed to allow air to flow freely past the sides of the car at speed must of necessity be vitiated if air has to be allowed to enter the shell in order to pass through a radiator. For this reason in the revised edition of the Napier-Campbell the radiator was removed altogether from its traditional place in the front of the car and in its place four sets of cooling tubes were mounted, two on either side of the tail, above and behind the back wheels. Much less attempt was made to keep the car narrow, and the bonnet was swept down in front to a horizontal line level with the front spring shackles so that the front of the car resembled the toe of a boot. Finally as a most interesting innovation a large stabilising tail fin was used. to its outline and it is curious that immediately afterwards the protagonists of careful streamlining should have received a moral blow when the record was lowered by White's Triplex which consisted of three engines set upon a chassis with no more bodywork than a bonnet to cover the front one. 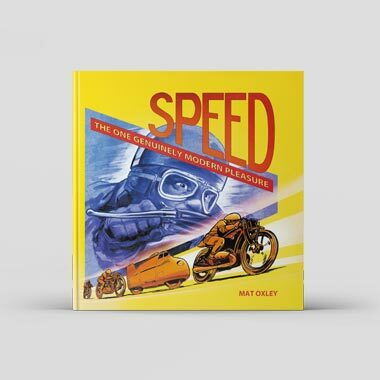 The next year, 1929, however, saw the appearance of an entirely new record breaker embodying the result of further streamlining research, in the form of the "Golden Arrow." This car was designed largely on the lines which had proved so successful in the Schneider Cup aeroplanes, and owed its shape in part to the special features of the Napier broad-arrow engine which was used. The car may in fact be said to have been built in. two sections, Me of which was represented by a low beetle-backed shell enclosing the inclined cylinder blocks and on the centre of which was mounted the second stream-lined structure covering the central vertical block and providing faring in front and behind for the driver's head. The radiators for this car were used as part of the separate streamlining for the wheels, between which they were arranged, and the striking success of the car provided perhaps, one of the best examples of how the automobile and aeroplane can contribute to their mutual development. records in the form of the" Silver Bullet." This machine incorporated many of the features of the earlier 1,000 h.p. Sunbeam, and was built on the beetle-back principle. 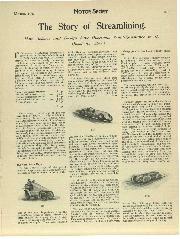 Probably, however, it had been found that the very large surface area of the earlier car had negatived some of its advantages in creating little disturbed air currents by causing considerable skin-friction, and the new car was therefore built much narrower and no attempt was made to include the wheels in the streamlining. In the "Silver Bullet" also, air was not allowed to enter the shell in order to reach radiators, as in the case of the 1,000 h.p. Sunbeam, but the problem of engine cooling was solved by the use of ice-chests and water pumps—this machine being perhaps the only motor car ever made in which engine was neither directly nor indirectly air-cooled. 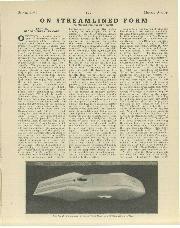 The story of streamlining may fittingly be closed with a few remarks on Captain Campbell's latest record breaking car. This m_ici.ine is another most interesting study in streamlining and differs in material respects from those already described. In this case quite the same use is not made of the special features of the Napier engine as in the" Golden Arrow." 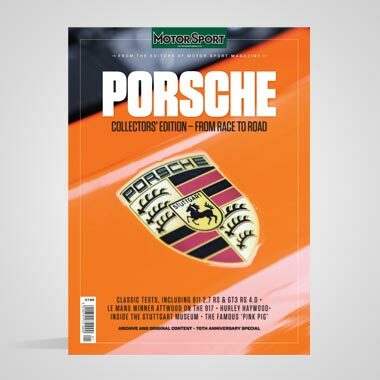 The body, however, consists of a beetlebacked section covering the engine and continued right through to the tail, while the driver sits behind the highest point of the curved top line and has his head streamlined by a separate faring projec: ing very slightly from the main body in. front and terminating in a huge directional fin at the back. In this case the cooling problem has been solved by placing the radiator of streamline shape at the front of the car but not allowing the air which passes through it to enter the streamline shell, with which it is connected simply by the pipes leading to the water tank. 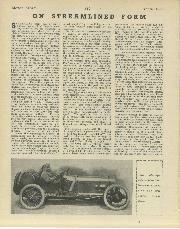 It is a far cry from the boat-shaped Boll& racer of 1898 to Malcolm Campbell's latest " Bluebird," but the change which has taken place has been brought about by gradual evolution and is one of the many arguments against those people who cannot understand the value of attempts to drive motor cars ever faster and faster.